... to get this work by watching RC Sproul’s teaching series on the book called Willing to Believe. It helped understand the issues surround the question of human freedom and sovereignty. 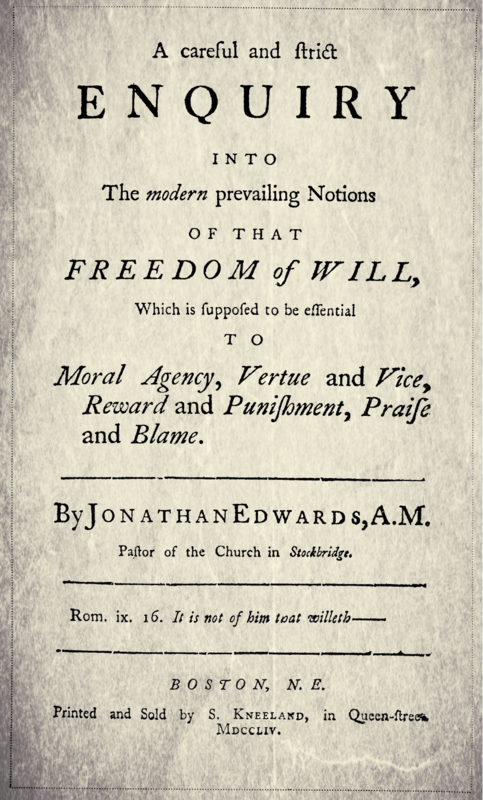 I remember that it was not much later than that I was studying Jonathan Edwards’ The Freedom of the Will, which was somewhat difficult. ...is created by the will of God (Rev. 4:11). Everything that was created, was created in the space of six days (Ex. 20:11). I think it is indisputable as to what these words meant for the writers of the Confession. When reading old authors from the 17th century, it is not unusual to read them dating events from the creation of Adam. The six days of creation had the same span as normal six days as they experienced them. They have no knowledge of the mess that theologians have made about the simple reading of Genesis 1 in our modern time. It is not that there was absolutely nothing said about the days, but it was not such a mess as it is now (Augustine, for example, believed that everything was created in a moment). All these things were created very good (Gen. 1:31). Nothing was created evil or sinful, but they were all good and sinless. ...l, how much more the good actions? For the case that God ordains and is sovereign even over the evil actions of men and yet holds them accountable, see chapter 3 section 1 where I try to argue just that from the biblical texts. Consistent with what the Confession said in chapters 3 and 5, the freedom spoken by the 1689 is not a freedom of will from God’s sovereignty, but freedom of will within God’s sovereign decree. Since in fact love is only made perfect through the two commands of love of God and neighbour, why is it that in both letters the Apostle mentions only the love of neighbour, unless it is because people can lie about their love of God, since it is put to the test less often, but they are more easily found guilty of not loving their neighbour when they behave wickedly towards others…in a question of works of righteousness it is usually enough to mention just one of them, but it is more appropriate to mention the one on the basis of which a person is more easily found guilty. If the love be sincere, it is accepted as the fulfilling of the law. Surely we serve a good master, that has summed up all our duty in one word, and that a short word and a sweet word--love, the beauty and harmony of the universe. Loving and being loved is all the pleasure, joy, and happiness, of an intelligent being. Love is the fulfilling of the Law because love is what the Law demands. The prohibitions of the Law are not unreasonable restraints on Christian liberty, but the just and wise requirements of love. We may add that the above is another passage which serves to explain Rom. 3:31, for it supplies a practical exemplification of the way in which the Gospel establishes the Law as the expression of the Divine will, which love alone can fulfill. What are “the commandments of God” that are being referred to here? I believe that the moral law is being referred to here. It is interesting to note that whenever the word “commandments” (plural) is used and a list is given, it is always the Decalogue (Matt. 19:17-19; Mark 10:19; Luke 18:20), the summary of the Decalogue (Matt. 22:37-40; Mark. 12:29-31) or Jesus’ commandment to love each other (John 14:15, 21; 15:10). Moreover, even if the singular “commandment” is used and a listing is given, it concerns the commandments of the Decalogue (e.g. Rom. 13:9). My point is that “the commandments of God” here refer to the moral law of God as summarized in the Decalogue and strengthened by Christ (Paul would later speak of the Law of Christ, see below). What is important is that we keep God's commandments. What is here encouraged and contrasted are the moral commandments of God and the ceremonial commandments of God. ... Ghost. It is certain that God did grant the gift of the Holy Spirit under the old testament, and his operations during that season, but it is no less certain, that there was always a promise of his more signal effusion upon the confirmation and establishment of the new covenant. See in particular that great promise to this purpose, Joe 2:28-29, as applied and expounded by the apostle Peter, Act 2:16-18. “the Comforter would not come; but if he so went away, he would send him from the Father,” Joh 16:7. They differ in the declaration made in them of the kingdom of God. It is the observation of Augustine, that the very name of “the kingdom of heaven” is peculiar unto the new testament. It is true, God reigned in and over the church under the old testament; but his rule was such, and had such a relation unto secular things, especially with respect unto the land of Canaan, and the flourishing condition of the people therein, as that it had an appearance of a kingdom of this world. But now in the gospel, the nature of the kingdom of God, where it is, and wherein it consists, is plainly and evidently declared, unto the unspeakable consolation of believers. For whereas it is now known and experienced to be internal, spiritual, and heavenly, they have no less assured interest in it and advantage by it, in all the troubles which they may undergo in this world, than they could have in the fullest possession of all earthly enjoyments. They differ in their substance and end. The old covenant was typical, shadowy, and removable, Heb 10:1. The new covenant is substantial and permanent, as containing the body, which is Christ. They differ in the extent of their administration, according unto the will of God. The first was confined unto the posterity of Abraham according to the flesh, and unto them especially in the land of Canaan, Deu 5:3, with some few proselytes that were joined unto them, excluding all others from the participation of the benefits of it. But the administration of the new covenant is extended unto all nations under heaven; none being excluded, on the account of tongue, language, family, nation, or place of habitation. All have an equal interest in the rising Sun. The partition wall is broken down, and the gates of the new Jerusalem are set open unto all comers upon the gospel invitation. This is frequently taken notice of in the Scripture. See Mat 28:19; Mar 16:15; Joh 11:51-52; Joh 12:32; Act 17:30; Act 11:18, Gal 5:6; Eph 2:11-16; Gen. 3:8-10; Col 3:10-11; 1Jn 2:2; Rev 5:9. They differ in their efficacy; for the old covenant “made nothing perfect,” it could effect none of the things it did represent, nor introduce that perfect or complete state which God had designed for the church. They differ in their duration: for the one was to be removed, and the other to abide for ever; which must be declared on the ensuing verses. If the Law and the Mosaic Covenant cannot save and offer salvation, then one might wonder to what end was it given? The question and the answer thereof is addressed in Galatians 3:19-24, which we will look at now.